More surprising is to get off the train at Jüterbog deep in rural Brandenburg and be confronted with a poster like this. 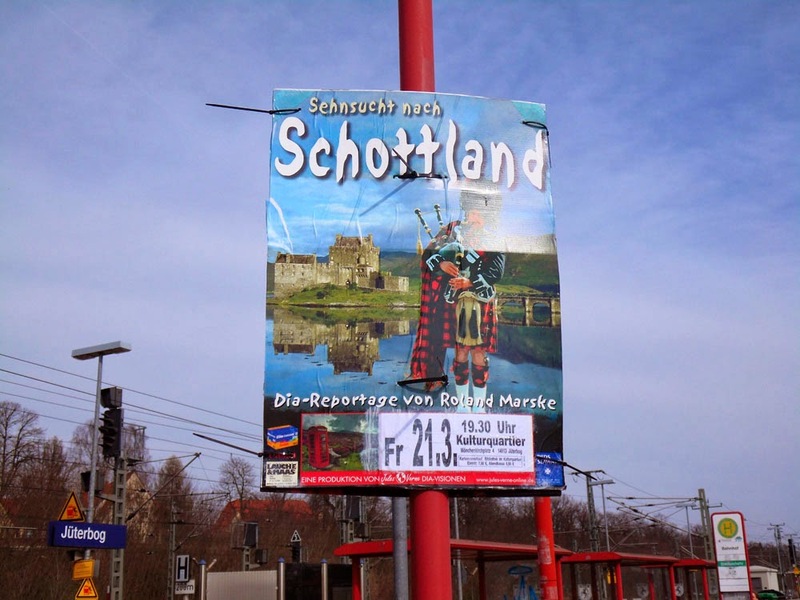 It advertises a cultural event this evening, in this small former Soviet town, themed around a nostalgic longing for Scotland. It is advertised by an oh-good-lord-no-not-cliched-at-all highland-dress-wearing bagpiper posing in front of Eilean Donan castle. They even get a red telephone box in there - very Local Hero! Why they didn't go full hog and have Nessie in Loch Duich there in the background I don't know. Oh, I know why, because the artist of this masterpiece probably has never been anywhere near Scotland, otherwise they would know that the Great Highland Bag-pipe is played the other way around! (i.e. drones over the left shoulder). Maybe sehnsucht is like looking back in time through a mirrored reflection. Or something. That might explain why his dirk is also in the wrong sock. Much as I too have fond memories of the Scottish highlands, I think I'll give this a miss. Got far too much cycling along the Fläming-Skate to do today. Cycling in Brandenburg can be Fläming Dangerous! Alehoof in bloom - Spring is coming!